Members and brain trusts of the nation's 7,000-plus credit unions remain frustrated that Congress hasn't yet approved the long-sought boost of the cap limiting commercial property-secured and other business loans to 12.25 percent of a given co-operative's assets. And now that great expectations about raising the cap to 27.5 percent were dashed once again by the 112th Congress late last year, not-for-profit credit unions even fear the potential loss of their tax-exempt status with comprehensive tax reform looming ahead in the 113th. But while the cap is making it tough for at least several hundred active CUs to continue meeting their members' business and CRE borrowing needs, in reality small-balance lending among these institutions is pretty brisk these days. One reason: in a word, participation - generally synonymous with what's known as syndication among banks and other lender categories. The reality is also that most CUs are not active at all in what's known as member business lending (MBL) - as distinguished from residential and auto loans, credit cards and the like. But any such institution lacking the requisite infrastructure and expertise can invest deposits into participations in MBLs originated by other CUs or credit union service organizations (CUSOs), which (among other functions) originate and service loans on behalf of CUs. 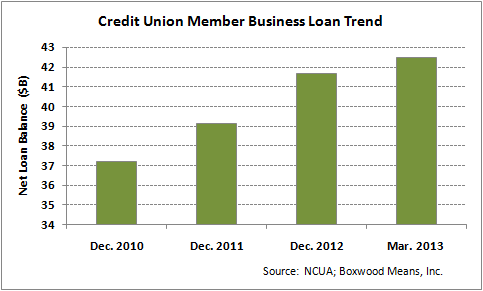 It's an increasingly popular strategy that's helping credit unions collectively boost CRE and other business lending. It's also attracting more CU members seeking small-balance loans, which tend to come at rates and terms at least a bit more borrower-friendly than quotes from community and regional banks that need to generate profits for shareholders. Indeed as CUs team up to meet strong MBL demand by sharing balance-sheet capacities as they're able, participation is "more active today than ever," observes longtime CU figure Troy Stang, president of the Northwest Credit Union Association. To wit after posting solid net MBL balance growth of about 6.5 percent in 2012, federally insured credit unions loaned at an even brisker pace (7.6 percent) in the first quarter of this year - pushing their collective MBL balance to about $42.5 billion. The Credit Union National Association calculates this figure amounts to 6.2 percent of all outstanding small business loans from US depository institutions. And not only did overall CU deposits rise nearly 15 percent last year, the overall loan delinquency rate among federal CUs declined sharply from 1.60 percent to 1.16 - and further down to barely 1 percent by the end of first quarter. Given the competitive rates CUs offer, along with the sector’s deep capacity for further MBL activity (notwithstanding the cap issue), it's no surprise business is booming at CUSOs such as Business Partners LLC in Chatsworth, Cal. BP, which is now owned primarily by three CUs (with several smaller holding stakes as well), booked about twice as much business in the second quarter as the first, notes small-balance lending veteran Gary Bechtel, BP's chief lending officer. A growing number of CUs these days see MBL participations as strong opportunities to secure attractive risk-adjusted investment returns, and diversify portfolios by asset class and geographic market - without investing heavily in originations, underwriting or servicing infrastructures, Bechtel stresses. And some CUSOs such as BP focus to some degree on helping CUs participate in larger CRE-secured loans than they'd likely approve as sole lenders. Reflecting the general emphasis on small-business lending, the national average for MBL amounts is in the vicinity of just $225,000 - with many CUSOs averaging perhaps $500,000 or less even with participated loans, Bechtel notes. BP's expertise is in somewhat larger CRE-secured transactions, with its average closer to $3 million due in part to its emphasis on coordinating participations of loans originated by owner and client CUs. BP's CRE activities are generally tiered into a small-balance category focused mostly on the $750,000-to-$2.5 million deal size, along with a sister tier ranging up to $10 million. BP's transactions also tend to reflect CUs' general preferred sweet spot: five-year fixed-rate term loans secured by stabilized properties, and guaranteed through what amounts to full joint-and-several recourse by individual owners of borrowing entities. Many institutions within BP's network of 170-some participant CUs also look to serve secondary markets, where small businesses and CRE investors tend to be under-served by the finance sector. In addition to the primary CRE categories including apartments, BP is comfortable lending against health care properties, seniors housing, self-storage complexes and manufactured-home communities. It looks to avoid auto repair centers and filling stations, and limits hotel exposure to core markets (and at lower leverage). Loan-to-value ratios generally range from 65 percent for the likes of unanchored retail and special-purpose properties, up to 75 for core-quality properties such as multifamily and credit single-tenant transactions. While Bechtel is logically concerned about the recent impact of Treasury yield volatility on CRE lending rates, he's also encouraged that BP's Q3 pipeline is looking pretty strong at this point. Even though rates did climb somewhat over the last month or so, borrowing costs remain exceptionally attractive from a historic perspective. The yield on the five-year T increased roughly 80 basis points to 1.45 percent in less than two months - but started the run-up from about as low as it's ever been. BP has continued quoting five-year loans in the general range of 4.5 to 5.25 percent depending on risk factors - perhaps 25 basis points higher than the low-point. It's not unreasonable to expect gradual hikes in index benchmarks as long as the economy continues to improve in coming years, Bechtel adds. Meanwhile if the Senate and House can somehow agree on legislation including the MBL cap expansion, BP and its clients would presumably have a lot more to lend - CUNA pegs the potentially freed-up capital at $13 billion under the 27.5 percent proposal. CU members justifiably expect access to that additional capital, but "can't get at it just yet" due in part to the success of the banking lobby's rhetoric, Stang laments. Bechtel for his part would likewise like to see the cap lifted, but notes that it would significantly affect only a relatively few, larger cap-hampered CUs that have considerable MBL experience and sophisticated underwriting policies. The vast majority of CUs are for the most part "prudent" in keeping MBL exposure below 12.25 percent, he concludes.